Jenny Sennott’s Wine and Roses Scarves require only 3 balls of yarn for both of them. 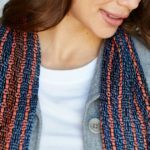 After sampling Cascade Yarns’ Roslyn for the September/October 2018 Yarn Lab[https://www.interweave.com/store/handwoven-september-october-2018-digital-edition], I knew I wanted to weave some scarves with it. The 65% wool/35% silk yarn makes fabrics that are ultrasoft and warm with a lovely drape. For a little pizzazz, I added a border pattern inspired by an idea in Jane Patrick’s The Weaver’s Idea Book, combining supplementary weft floats with just a touch of lace. I used Silver, doubled on the shuttle, for the supplementary weft color. The border requires only one pick-up stick that can remain in the warp at the back of the loom for the entire scarf, so weaving went quickly. As I wove, I noticed the yarn shedding tiny neps, but wet-finishing washed them away. As I neared the end of the grape-colored scarf, I realized that there was still quite a lot of yarn remaining. Deciding it would be a shame to stash those lovely yarns indefinitely, I swapped Grape and Silver in the warp color order and played “yarn chicken” as I wove a second silver scarf, not knowing if I would have enough weft to finish the scarf. Although I got a bit nervous toward the end, I ended up with enough yarn to finish and had some left over. Getting 2 scarves from 3 balls of yarn was a pleasant surprise. If you decide to weave both scarves, I recommend following the measurements and weaving instructions carefully so as not to run out of weft yarn. STRUCTURE: Plain weave with supplemental weft and lace. EQUIPMENT: Rigid-heddle loom, 10″ weaving width; 10-dent heddle; 2 shuttles; 2 pick-up sticks. YARNS: Roslyn (65% merino wool/35% silk; 383 yd/3.5 oz skein; 1,750 yd/lb; Cascade Yarns). Featured Image: Jenny Sennott’s Wine and Roses Scarves are extra pretty in purples and pinks.